ConceptDraw has numerous Appliances Symbols for Building Plans. You can create building plans using the library of Appliances Symbols of the home appliances manufacturers, home appliances online, home appliances sale. 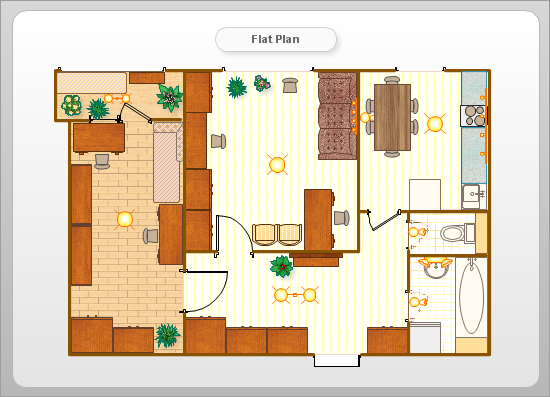 ConceptDraw is intuitive building plan software for creating great-looking office layout and commercial floor plans includes appliances, bath kitchen, building core, cabinets, electrical and telecom, furniture, garden accessories, wall, shell and structure, cubicles, office accessories, office equipment, office furniture, planting, wall, door and window. The kitchen layout is the view that is made by the disposition of the furniture, kitchen appliances, such as stove, refregerator, dishwasher, coffee machine, water cooler etc. When designing your kitchen layout and selecting the best solution for your house, one of the main points is the overall layout of the kitchen and its appliances. Using design elements provides by the Appliances libraries, that is included into ConceptDraw Floor Plans solution you can easily develop best layout for your kitchen, bathroom and laundry.